At the North-West Regional Brass Band Championships in Blackpool this weekend the band gained a creditable 4th place out of the 15 entrants in the 1st Section. Unfortunately it means we miss out on a trip to Cheltenham for the National Finals, but adjudicator Richard Marshall revealed that it had been ‘very close’ between the three bands that eventually battled for the second qualification place. Although this was not quite the result we had worked so hard for, it does look, however, like promotion back into the Championship Section may well be on the cards. Whilst we have to wait for official confirmation from the North-West Regional Committee, going by the official Kapitol rules and the placing of the band over the last three years Regional competitions, we believe that there could be four bands from the current North-West 1st section gaining promotion for the start of next year. These bands would be Morecambe on 14 points, and Ashton-Under-Lyne, Oldham (Lees) and, of course, Vernon Building Society (Poynton) Brass Band who are all on 15 points over the 3 years' placings. We wait with baited breath for official confirmation, but look forward to fighting it out against the other big hitters in the North West - Faireys, Fodens, Milnrow etc - at next years competition! Thank you to all those who participated in the inaugural 100 club for the year 2014. The band played brilliantly this weekend at the Butlin's Mineworkers Brass Band Championships. Playing off a number 4 draw, the band had played by 11am, and had put in an excellent performance of Paul Lovatt-Cooper's Vitae Aeternum in the 1st Section competition. The audience listening certainly felt the band played well as they erupted at the end of the piece with even the banding press commenting on how well received it was by the audience. 4BarsRest reported the band as delivering a 'Heart on Sleeve' account of the set piece, with effective playing on display and lots of controlled dynamics. The performance must have stuck in the minds of the two adjudicators, Frank Renton & Derek Southcott, as after all twenty two bands had played in the 1st section (over 5 hours after Poynton band had played), they still awarded the band with the 2nd Prize worth £1000. Many thanks to Neil Samuel for his hard work preparing and rehearsing the band for this contest. Many of the band came off stage with the opinion that it was the best performance the band had given in many years, and in the wise words of Alan Lawton after we played "I wouldn't want to be in the band following that performance!" Now to start looking towards the North-West Regional Championships where another good result could see us back into the Championship section for 2015, and hopefully at the National Finals later on this year. In March we said our goodbyes to MD Colin Short after a great couple of years, as he moved on due to work commitments and we asked Neil Samuel to lead us at the area which led to a solid 5th place, and shortly after both parties agreed to continue to work together! April: A 2nd place at Buxton Contest on Dances & Arias after just one week of intense rehearsals with Neil. June: Competing at every Whit Friday venue in Tameside (in a record time of just over 5 hours) the band picked up a number of 1st Section Prizes, as well as winning the Tame Valley contest beating some of the countries top bands in the process! We also did concerts with the Beatles and Take That (or at least their tribute bands) in two outdoor concerts with thousands of revellers listening to us perform. August: The band was pleased to welcome top brass band composer Darrol Barry as their Composer-in-Residence. September: The band performed with a top West End Star Zoe Rainey in aid of the Together Trust. We also came away with a 3rd place at Fleetwood Contest playing Philip Wilby's notoriously difficult Red Priest. November: We took to the stage at the Northern Open contest, again with Red Priest and this time came away with a 2nd Place result. December: "It's Christmas"... The band, as usual, performed numerous Christmas Concerts through out the month, ranging from traditional carol concerts alongside the St George's Singers to Christmas Bier Keller's at Davenport Golf Club! Through the year we've said some goodbye's and said some hello's to both new and old faces and a lot has been achieved in a short space of time, and we're already planning on how to improve next year! To all of our supporters through 2013, thank you and we would like to wish you all a Happy New Year! 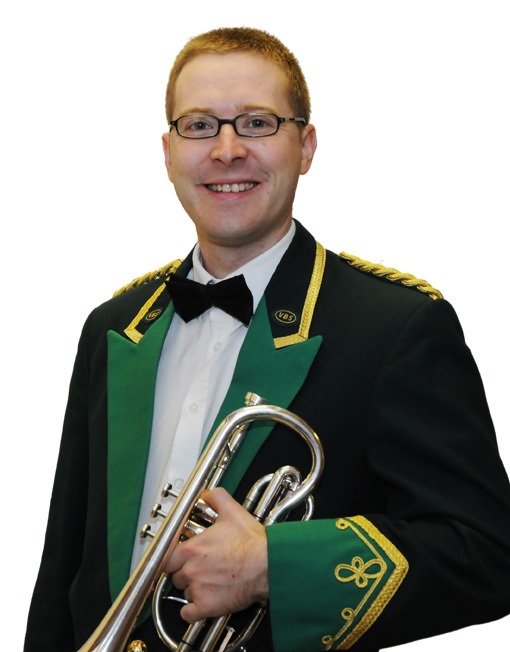 VBS Poynton Band would like to welcome cornet player Peter Weaver back to the band. Peter left the band a few years ago to take up a job in America. Peter will be returning to his familiar 'third man down' chair. As Peter joins we say goodbye to back row cornet player Rachel Hall who has left the band to pursue other hobbies and ventures. Speaking on behalf of the band Dave Johnson told A4B, "I would like to welcome Pete back to the band, he's a fantastic asset and we are thrilled that he has chosen to come back to our band family! Saying goodbye is always difficult especially when the players have been committed as much as Rachel. She has been a brilliant asset to our band and I wish her all the best. Speaking about the band, Dave told us "This year has been a fantastic year for the band given that out of four contests with MD Neil Samuel, we have finished in the prizes at all bar one. We've also performed at some real high profile concerts, including one for local charity 'The Together Trust' that saw the band perform with ex Wicked star Zoe Rainey. Watch this space, I believe this year is the start of more good things to come"
Yesterday the band took to the stage at St Helen's Theatre Royal for the Northern Open Brass Band Championships. The band, all with one finger nail painted in the 'Vernon Green' colour, was the last group to play on the day. We left our best performance of Philip Wilby's Red Priest in the rehearsal room and all came off stage knowing that we hadn't played anywhere near our best... but it shows how far the band has come over recent months when we still managed to claim the 2nd place prize on what we felt to be a poor performance! The band now looks forward to getting the Christmas Music pads out for a fun filled festive season, whilst also getting to grips with the Butlins test piece Vitae Aeternum by Paul Lovatt-Cooper. The band remembered and celebrated the lives of those who have fought for our country this weekend. On Saturday the band performed a Remembrance Concert at the United Reform Church, Great Moor. Featuring music such as the march 'On the Quarter Deck' and 'Hymn to the Fallen' from Saving Private Ryan, the band also lead the singing of hymns whilst Principal Cornet Tony Wyatt played the Last Post during the Act of Remembrance. A rousing 'Last Night of the Proms' set at the end of the concert left the audience wanting more. On Sunday morning, the band was proud to lead the Remembrance procession through Poynton to St George's Church for the Remembrance Service. Once again the band lead the hymn singing and Tony played the Last Post at the memorial. A moving day, as always. 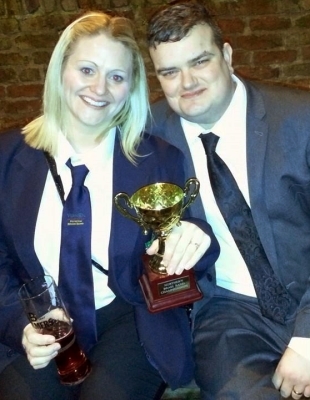 At the end of September the band took part in the Fleetwood Open Brass Band Championships. Playing Red Priest by Philip Wilby - a work recently used at the European Championships to test the best bands from across the continent - the band gained an admirable 3rd prize. The band has come on in leaps and bounds under new MD Neil Samuel and this performance, with the band taking on and feeling confident in playing such a difficult work, shows how the band is enjoying working with Neil. We look forward to coming higher up the prizes still at our next contests: The Northern Open Brass Band Championships, Butlins Mineworkers Contest and the North West Regional Championships.